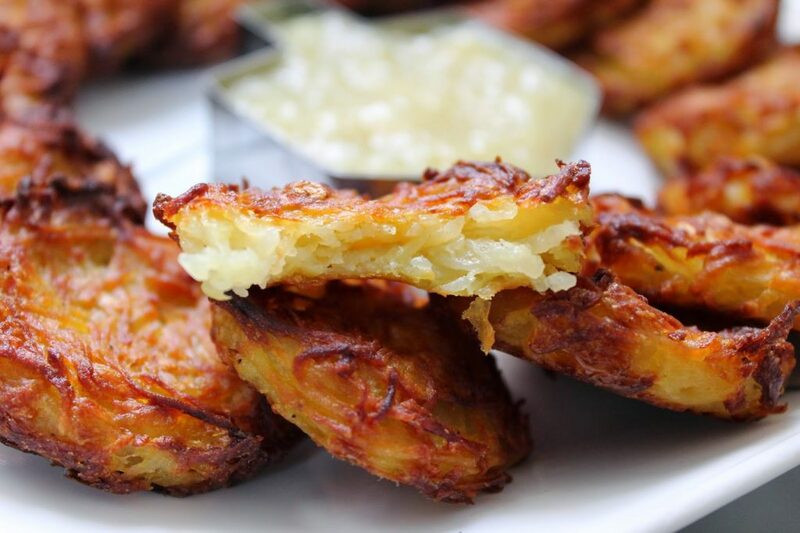 Crispy Oven-Baked Potato Latkes - No Way That's Healthy! Last year I tried and tried to make no fry latkes. They came out tasting nothing like latkes. 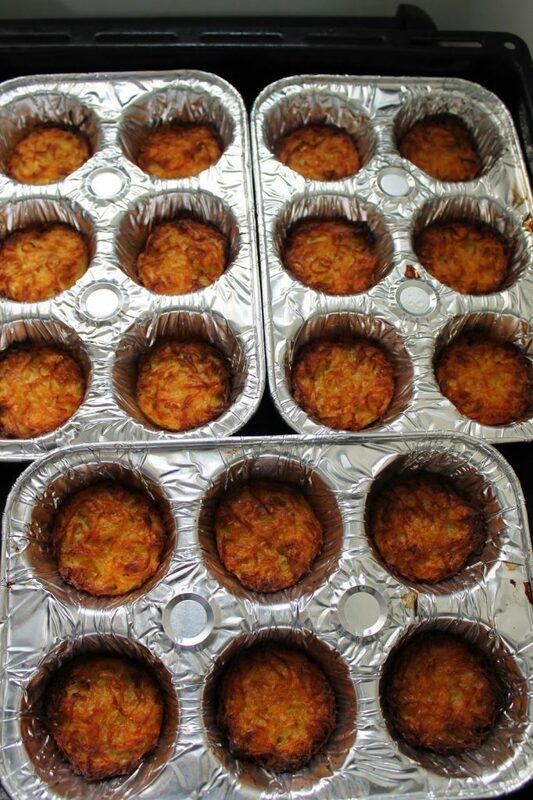 Then I had this great idea to put the latke batter in a cupcake pan and voila- perfect latkes every time! These have the crispy exterior and tastes just like fried latkes, except you barely use any oil here. You also don’t need to stand over a pan of oil frying every latke. If you are looking for a healthier alternative with the same taste as a fried latke, look no further. And yes, I know the point this holiday is to fry foods (so go for it! ), but it’s also to remember how just a little bit of oil went a long way and in this recipe that is definitely the case! Want more healthy recipes? Be sure to subscribe and follow on instagram for even more! Grate the potatoes and onion. Add in the olive oil, egg, salt and pepper and mix. Spray your cupcake baking pan well with the oil. Use a tablespoon to distribute the mixture. Do not use all the liquid in the bowl, You should have just a little, otherwise squeeze out most of it. Do not fill the cupcake pan too high. You want them to be flatter just like regular latkes. After they are all in, press them down a bit then spray the tops with the oil. Bake in the oven for about 30-40 minutes until the tops are browned a little. If the tops aren’t browning for you, put the oven on broil for a few minutes and the tops should brown nicely. These turn out best in aluminum pans. I've been told by others that they worked fine in regular muffin/cupcake metal pans, though that hasn't been the case for me. Time needed may vary so keep an eye on the oven. Serve with unsweetened applesauce or sour cream. These are beautiful! You mastered it! Thanks Tali, I was super excited when they finally came out this good! we're going to make these for x-mass day meal. Can I use my regular large size nonstick cupcake molds or do they come out better made in the thin aluminum pans as shown? That should work too! Spray them with oil still so they crisp up. Enjoy! What a clever idea! These look perfect. 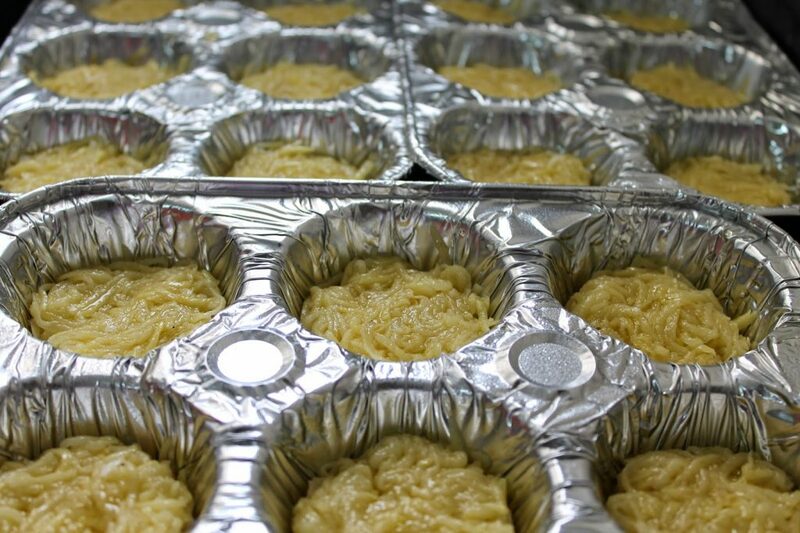 Can I use muffin tin liners? Would I have to oil them? I don't use cooking spray. Any other ideas? You need the tin part to make them crisp up, not sure if paper liners would do that. You can dip a paper towel into some oil and coat the pan. I also like using my misto oil sprayer that I put olive oil into. can you use non stick cupcake pans or do they have to be the disposable ones for the crispiness? Yes that should work fine You need the metal to help get them crispy. It should work fine, just don't use paper liners. How did you get the applesauce to stay in shape? I used a dreidel shaped cookie cutter, poured the apple sauce inside and lifted it up. If you feel it wont stay in that shape you can just keep it in the cookie cutter and not lift it up. Do you not use flour or matzo meal? In this recipe, no, you don't need it. Can you use a regular cupcake pan, rather than the tinfoil one? I've never seen them anyway. Yes that should work, just don't use paper liners or it won't get crispy. These look wonderful…do you squeeze out your potatoes before you add the egg and onion? You mentioned just using a little of the liquid from the bowl and discarding the rest — but can you give any guidelines about how much liquid is acceptable and how much is too much. I don't squeeze out the potatoes as that is just another step and I prefer an easy recipe. Using a spoon with wholes, like a slotted spoon to scoop out the potato latke batter should give you the right amount of liquid. If you see in the pictures of them before they are baked, they aren't covered in liquid. Don't be worried you kept too much liquid in it anyway as it should evaporate a little and you will still get a nice crispy latke. Enjoy! You made 18 latkes. 15 are on the plate. Did the other 3 accidentally fall on the floor and get eaten by a dog, or could a human somehow have eaten them before the guests arrived? Hehe. Recipe actually made 24! Everyone needed to "taste test" these of course, before sharing on the blog. I would NEVER drop one of these beauty's on the floor!! If I use my Cuisinart to grate the potatoes, should they be coarsely grated? Looks like yours have that coarse look to them. I'm not sure, I just use the one that grates it. They come out pretty thin though. I don't think it will matter either way. Would it hurt to add a little mazoh meal? Or is it better without? I'm sure this technique of baking the latkes this way will work with most recipes, so if you prefer matzoh meal in your latke, you can add some. But my recipe does not need it and I feel it is great without it. Do you think using frozen shredded potatoes would work? I have a huge family. Not sure, there may be a higher water content in the frozen shredded potatoes and they may not crisp up. You can shred a lot of potatoes at once though if you use a food processor. That may help when making a large amount. LOVE this! 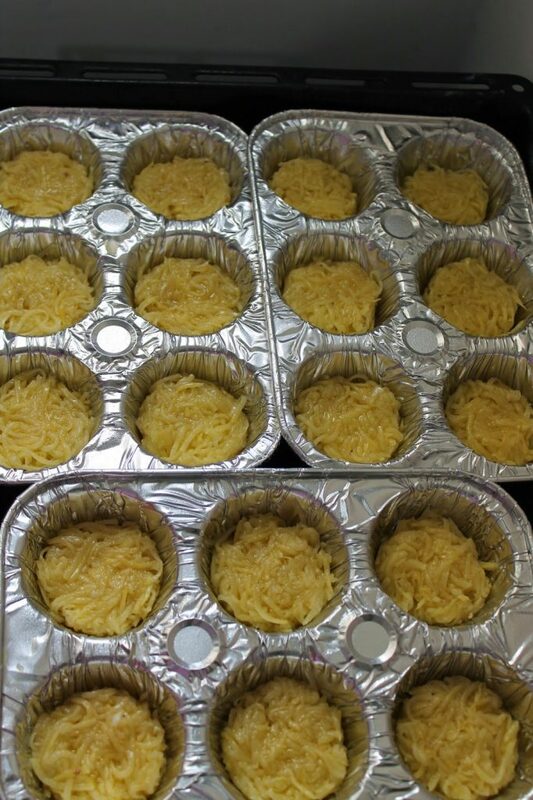 I am going to use my Pampered Chef Stoneware muffin pan…sadly we no longer sell it . But if you have one, this recipe will be amazing! Thank you for the recipe! 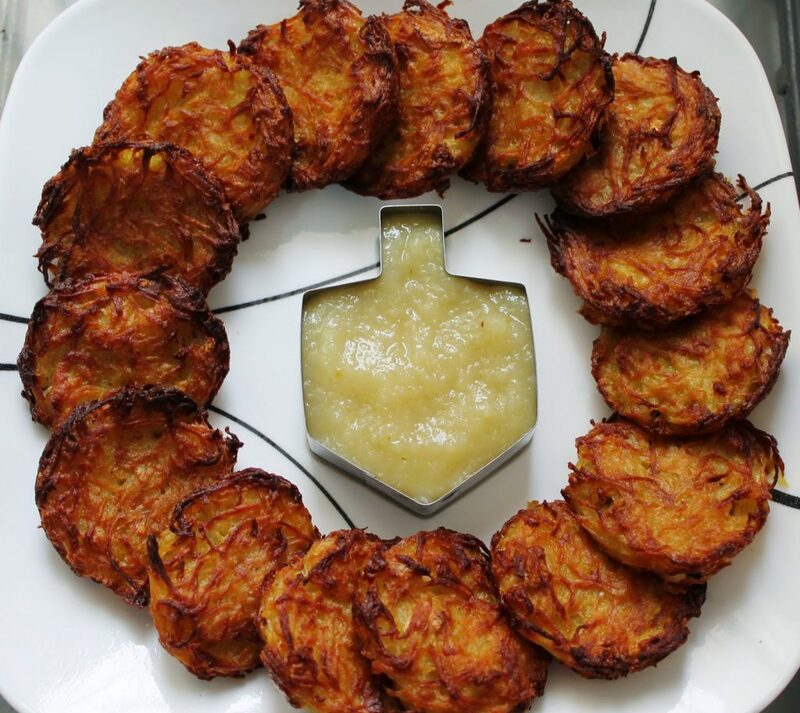 My husband just had a cardiac stent placed and he was feeling sad about no latkes ever again… I can't wait to surprise him! I'm going to use egg beaters, do you think it will turn out ok? He has a very nice wife!! Yes, I think egg beaters will work fine. 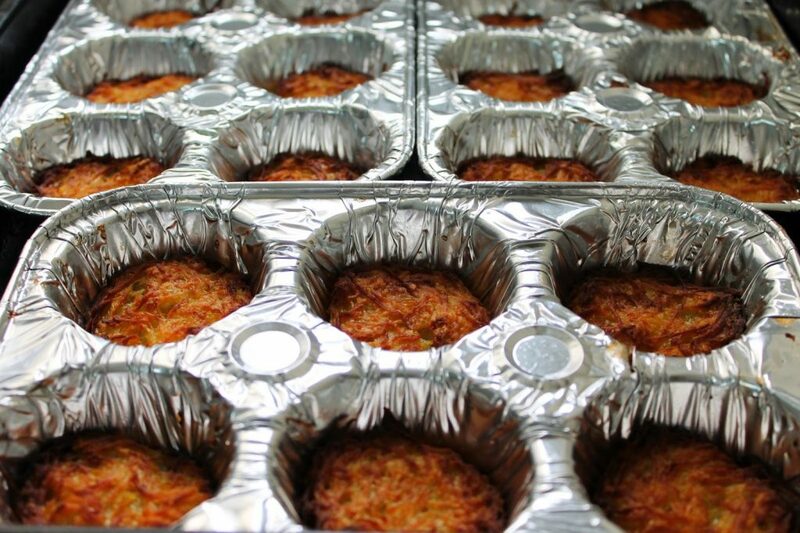 Do these latkes freeze and reheat well? Thanks for sharing your recipe. I never tried, but I think if you stored them in the fridge and reheated in the oven they will still be crispy, just do not over bake them or they will get too crispy and burn. How did they come out? I don't think it matters much if they are grated or shredded. As long as you follow the basic recipe and technique of how they are baked, they should turn out fine. Do the potatoes need to be peeled? Or just grate them with the skin on? I peeled them, but you do not need to if you do not want to. The peels do have added nutritional benefit. I was not sure how big to get the potatoes and the onion. I have a huge amount of potato/onion mixture. should I add more oil and another egg! Help! I am cooking them now. The amount of egg and oil should be fine. If you are nervous you have too much maybe one more egg can be added. Also please be sure you spray the pan really well. That way they will come out easily of the pan. Enjoy! 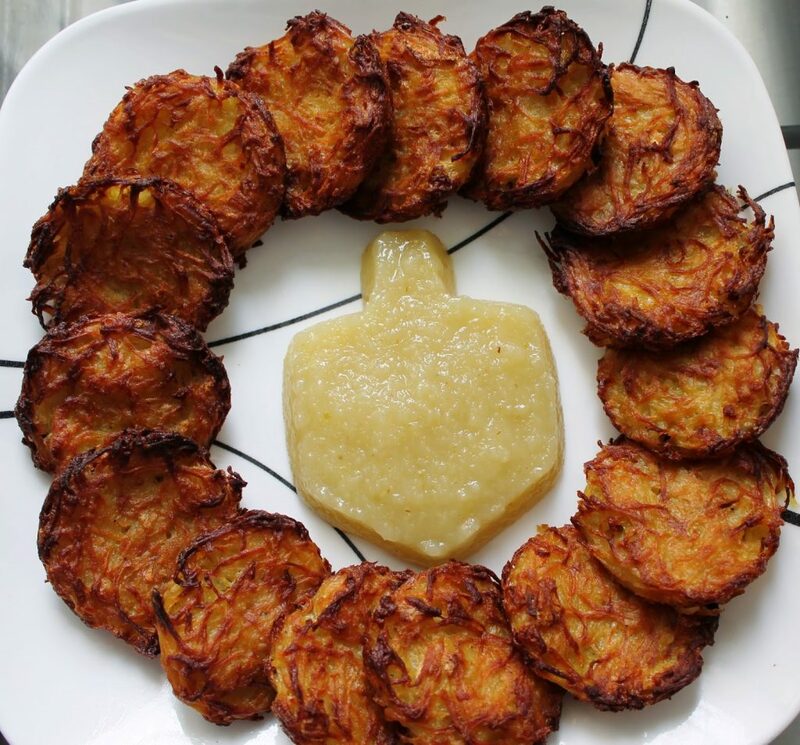 These were the best latkes I ever made!! Used the food processor and worked like a charm!! Can you grate the potatoes and onions by hand? I don't have a Cuisinart. Yes you can. You will be getting your workout in for the day! My husband wants to make these tonight (so excited nit to have to fry them) but I was wondering if you have a preference as to the type of potato. Yukon or Idaho etc? I don't think it matters really. I just used any potatoes I had. Enjoy! I also made them last night and we loved them !! Is the salt 1/4-1/2 tsp of salt or 1 1/4- 1 1/2 tsp of salt. Little confusing. Thanks! 1 1/4 to 1 1/2. Sorry for that! I suggest starting with less and if you feel it needs more add. Thanks! Made them today and they were soooo delicious! Really perfect and great that you dont have to mess with frying. The problem is they disappeared too quickly! Any solution for that :-)? Yummy!!! Do you use a certain type of potato, like Yukon Gold? It could be your oven or that you did not spray the tops enough. Next time maybe try broiling them at the very end to get the tops browned. Two questions. 1. I usually use a blender for a more smooth consistency for the Layla. Do you think that will matter with this recipe? #2. Does the bottom of the Latakia get crisp also? I never tried it blended so i’m no sure, sorry. Yes the bottom does get crispy. These rock! I’m going to make another batch for the freezer. My gluten-free friends are thrilled, too. Thanks for the recipe. I’m subscribing now! Can you use the same method for sweet potato latkes? You can try it but I think they don’t get as crispy as the moisture is higher in sweet potatoes.